Do you want to STOP YOUR RUG AND MAKE IT FLAT? You can DO IT WITH X-PROTECTOR RUG GRIPPERS! Our ANTI CURLING RUG GRIPPERS will STOP CURL & SLIDING Your rug & MAKE THE CORNERS FLAT. EASY TO USE – just set two carpet grips on every corner of Your rug, if the rug hasn’t the corners – set grips on the edge of the rug – as shown on the photo and instruction (we recommend to set 1 gripper for every 4 feet of the rug). MADE FOR LONG SERVICE – anti-curling grippers have PREMIUM QUALITY and RENEWABLE CARPET TAPE & STRONGEST ADHESIVE. For renew the sticky surface – wipe down the sticky surface with a wet cloth, for full renew – wipe floor and sticky surface with rubbing alcohol. It makes a perfect rug with the gripper. STOP SLIDING & SLIPPING YOUR RUGS ON ANY INDOOR FLOORS – our rug grips work like a gripper tape or double-sided rug tape – it’s SAFETY & EFFECTIVE FOR ANY HARD FLOORS – Wood, Linoleum, Tile, Laminate, Vinyl, Rubber, etc. Our carpet stickers much better than double-sided carpet tape heavy duty or carpet velcro! STOP CURLING OF THE CORNERS & STAY IN PLACE YOUR RUGS – our carpet gripper is perfect both indoors & outdoors and it has THICKNESS 1/8 inch only – totally invisible under the rug. It’s perfect non slip rug pad for any area rugs slip stop. 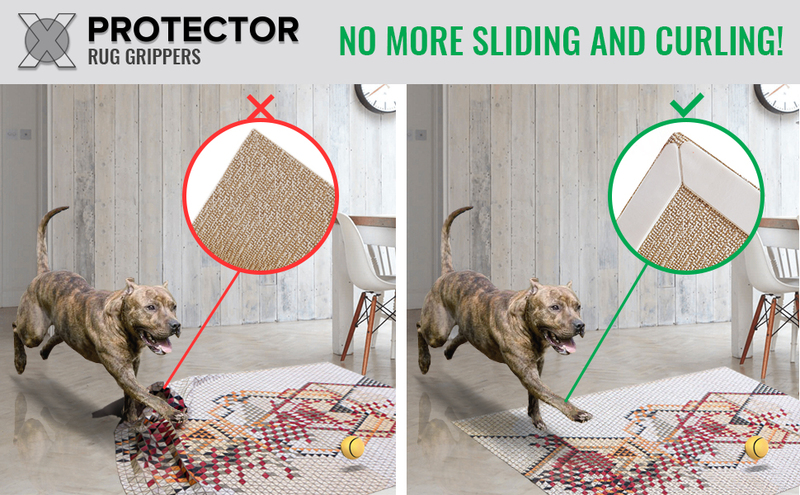 FORGET ABOUT SLIDING RUGS & CURLING CORNERS WITH RUG GRIPPERS X-PROTECTOR! FOR ALL FLOORS! FOR ALL PLACES! FOR ALL RUGS! X-PROTECTOR IS A REGISTERED TRADE MARK – AVOID CHEAP COPIES AND FAKES. IF YOU DON’T LIKE OUR NON SKID CARPET GRIPS – WE’LL RESOLVE ANY ISSUES. Attention – please use rug grippers with instruction only.